Welcome, Friends! I hope your week has been wonderful so far. 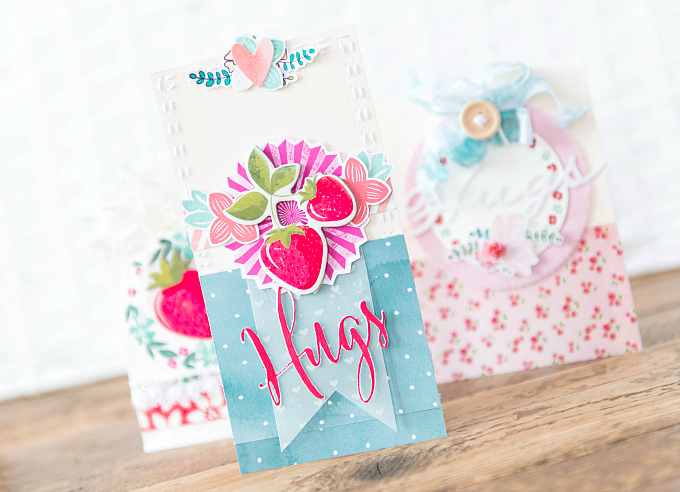 Today I'm popping in to share a set of cards inspired by our freezer full of berries. A little while back, we had the opportunity to spend a wonderful morning in the berry patch, picking pails upon pails of beautiful, sun-ripened strawberries. And since one can only eat so many while they're fresh, we decided to freeze the rest. I've been pondering all week what type of recipes I will use them in, so if you have any favorites, please do share below. I really wanted to crate something that made the strawberries pop, and I think these fit the bill! I love the bold, red details against the soft background. 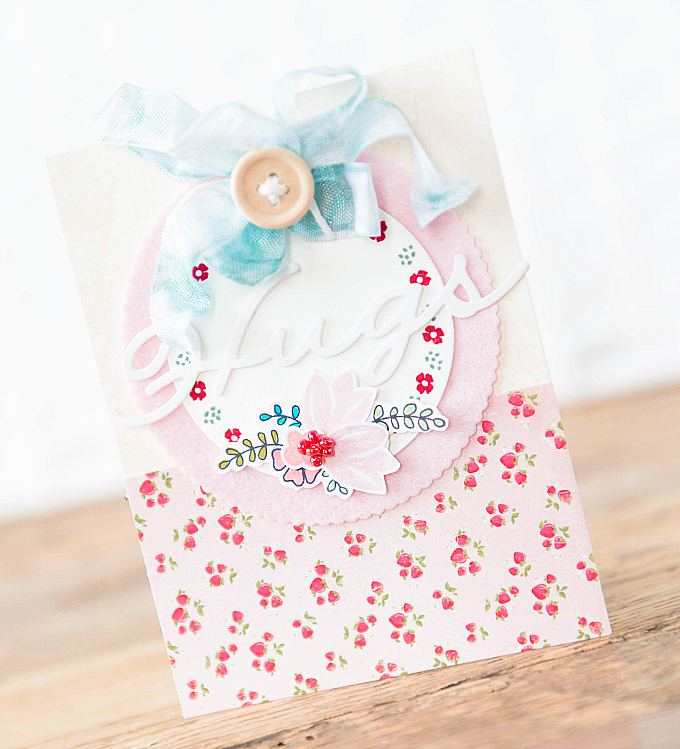 To create this card, I started with a cream and teal patterned paper, covering a base card. I used my Papertrey Ink Coin Purse Pockets die to cut the little holes around the cream colored paper, which I then stitched with white floss. 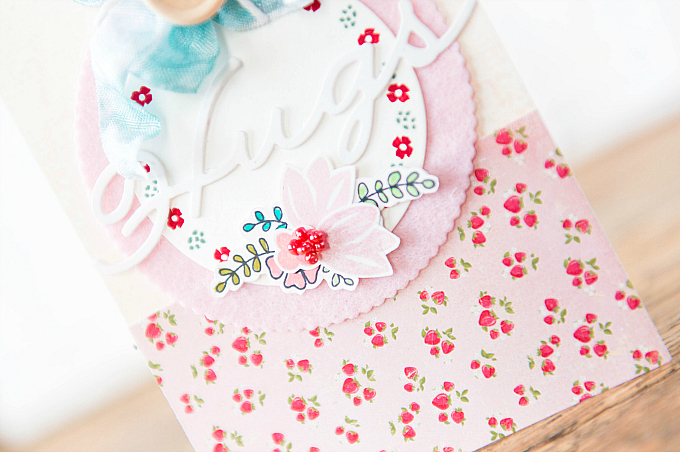 At the top of the card, I stamped and cut a few little leaves and a pretty flower from CTMH Shower Flowers stamp set. Just below, I used another CTMH stamp (I believe it's retired now) to crate the medallion, stamped in Raspberry Fizz ink from Papertrey Ink. 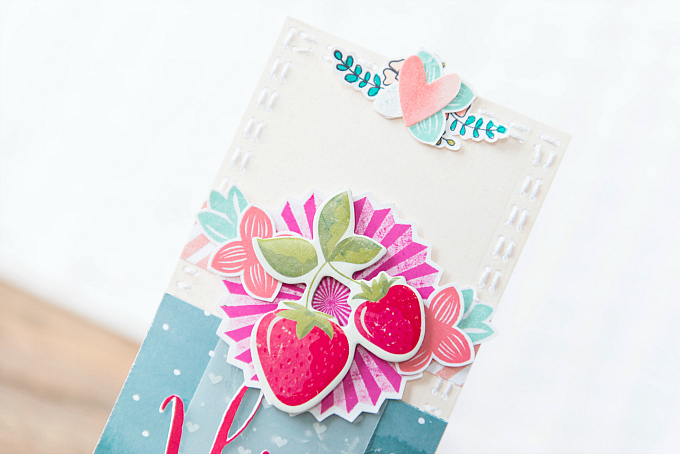 Sitting atop, I added a little chipboard strawberry motif, and a few more stamped flowers. For the bottom, I wanted to feature a bold sentiment, and this beautiful scripted font from PTI was perfect! 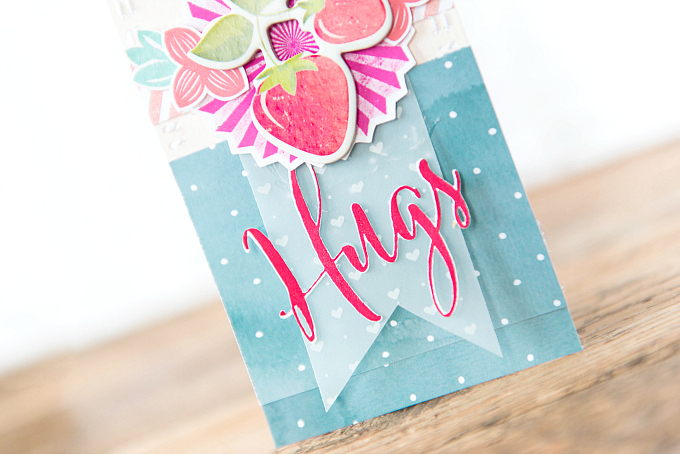 I used the Big Hugs stamp and die set. To start, I cut a piece of soft blush felt using PTI's Scene It: Basic Backer Die and then a simple cardstock punched circle. 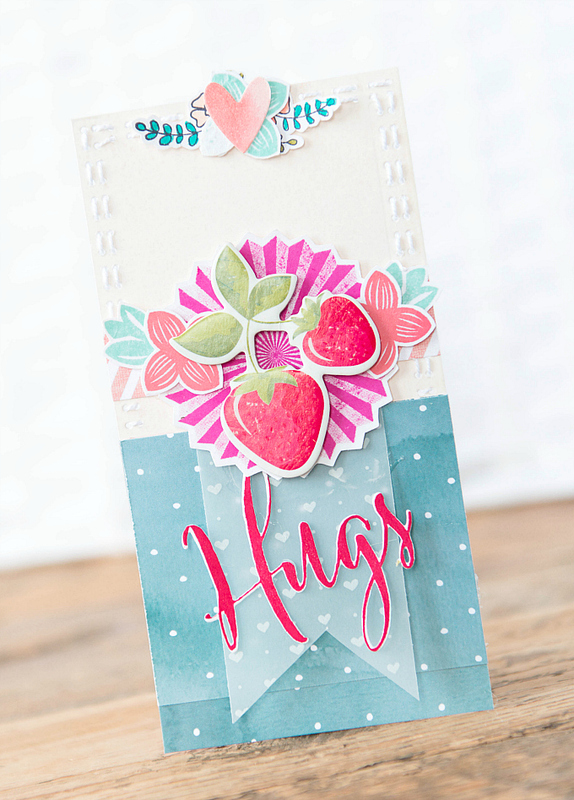 I stamped little flowers all around using WPlus9's Fresh Cut Florals in Pinefeather and Pure Poppy inks from PTI. 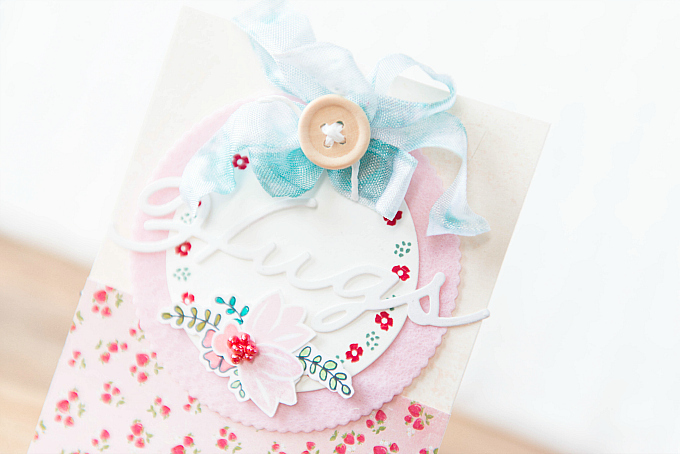 A button and some ribbon finish the tag as well as little cluster of flowers with a beaded center. For the last creation, I'm sharing a little pocket that would fit a bitty treat or two. 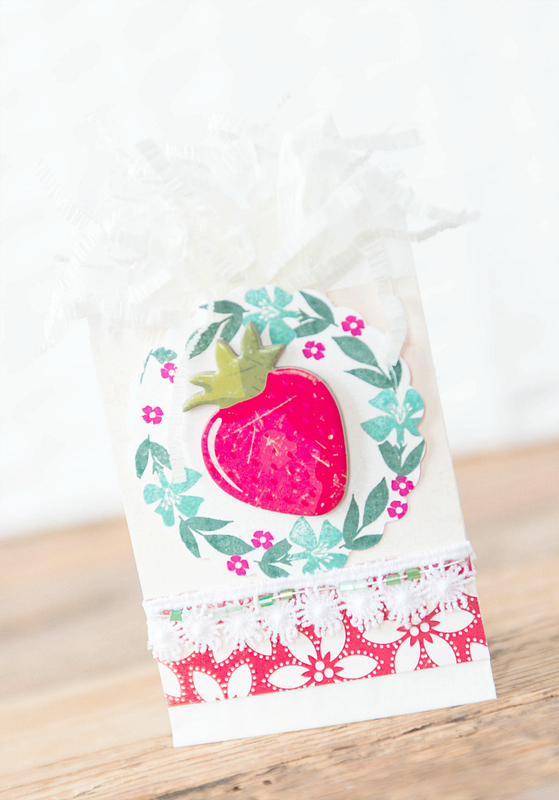 I used a glassine bag and a little bit of crepe paper at the top to create some ruffled texture. Just below, I punched a scalloped carstock tag, and stamped WPlus9's Fresh Cut Wreaths, in Pinefeather, Ocean Tides, and Raspberry Fizz. At the bottom, A little strip of patterned paper as well as a lace and bead accent. That's it form me today! Happy Weekend! These are all so fresh and lovely! A trio of fabulousness! Gorgeously heartwarming work as always! Love all the pretty layers and soft colors. Oh wow!! These cards are so fresh and pretty. Remind me of a day in the country! !